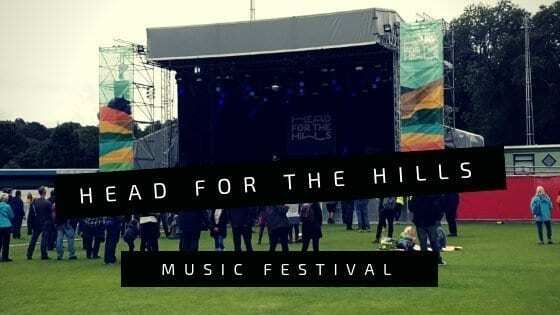 The Head For The Hills Festival totally rocks Ramsbottom and the surrounding Lancashire countryside to its core each year and it never fails to disappoint. With a shake-up to the original Friday headliner’s this year, The Beat unable to play due to illness were swiftly replaced by Manchester band The Slow Reader’s Club who were a firm favourite having played at the festival twice before. Taking to the stage as evening headliner’s though is something quite special and by all accounts were a great addition to the opening night of the festival. Liv and I attended on the Saturday – whilst the Friday night opener always sounds fantastic, being able to spend the full day at the festival when we are totally refreshed makes more sense. I am envious of those who have full weekend tickets though! Plus… throughout the Saturday and Sunday, there are plenty of family friendly activities to keep everyone entertained and that’s what we went to check out. Just before entering the Head For The Hills Festival, we came across the Playground of Illusions from the Travelling Light Circus pictured above. A fantastic array of engaging illusions that will totally trick the mind, incorporating both science and art in a fun way! The most amazing art installation from the Travelling Light Circus was featured inside the event – the Pendulum Wave Machine was beyond impressive! Combining mathematics and magic, the silvery spheres created the most amazing patterns when released and I can only imagine how impressive it as at night time time with added lights. It was relatively quiet when we arrived which meant we got the chance to have a walk around and proper look at everything on offer before the crowds descended. This was the first time in all our visits that we had prepared for the prospect of rain, but we treated with sunnier weather than expected that allowed the rain coats to be put away! As we entered we were greeted by the solo acoustic vocals of Barry Hyde from the Futureheads. He certainly had the intimate crowd engaging with songs and it paved the path nicely for the musically packed day that was to come. No festival is complete without having your face painted and whilst the queue was quiet, Liv jumped at the chance. This has been a bug bear of mine over the years as face painting has been somewhat extortionate and one year even went up in price over the weekend due to demand. Cheeky blighters! However this year, fabulous volunteers were offering face painting for a very reasonable £2 and as you can see, I had one very happy lady on my hands! Alongside the main stage, bands also delighted fans with their music at the Smaller Rooms Stage (red tent in the middle of the image above), the T’Other Stage in the Cricket club building, showcasing bands such as The Plumedores and the Beer Hall Stage. The Beer Hall stage was probably mine and Liv’s favourite of the day as that is where the silent disco was held! I have no idea why Liv and her friends didn’t want the grown up’s to take part in the ‘Adult’s vs Kid’s’ silent disco slot! There were several stalls dotted around the ground offering activities at different times during the day – the official festival programme was super handy to keep track of activities and bands. Unfortunately Liv didn’t get the chance to make slime as this had to be booked in advance, however the Scouts tent was fantastic and very welcoming. Not only did Liv get to make a friendship bracelet in around two minutes thank to an awesome contraption that made life easier, but she also got to start her own little fire Bear Grylls style and toast a marshmallow. A fantastic way to introduce what our local Scout group offer! Enough to give even adults nightmares but the duo of Baba Yaga’s House by Dizzy O’Dare were hilarious and mingled in with the crowds all weekend. We didn’t get to see many bands due to Liv being of an age where she could run around quite happily with her friends – just goes to show you how safe it is at the festival! With over 120 volunteers helping out over the weekend, it is always a very relaxed festival. The adults were quite happy to perch on a bench near the Churros (£5) and amazing Pizza (£7) stands. The food was very reasonably priced this year and the pizzas were amazing – so amazing it didn’t last long enough to take a picture! Conveniently placed, we could hear bands in the Smaller Rooms Stage such as Razz pictured above and the almighty Holy Moly & The Crackers on the Main Stage. I absolutely love this band! Having previously experienced them rock the smaller stage back in 2016, it was great to hear the gypsy folk band do their thing on the main stage. A very well deserved space and it would be great to see them back at the Head For The Hills Festival in the future – maybe as a headliner! Unfortunately, due to Sunday commitments we couldn’t stay to watch The Plumedores and Saturday night headliner’s The Bluetones and for that I was absolutely gutted. The Bluetones bring back such wonderful memories of teenage years though I have heard from ‘friends’ (gritted teeth), that the band were amazing. The Boomtown Rats closed the Head For The Hills Festival on the Sunday and were fantastic according to my friends Mike and Cathy who very kindly let me use this image. Sir Bob must have been having a very good weekend as everything was seamless and he even engaged with the crowd during his energetic set which delighted fans even more. Thank you to all who make the Head For The Hills Festival weekend possible and so awesome! It still amazes me that such a huge music festival takes place right on my doorstep in the sleepy village of Ramsbottom. Well, clearly it doesn’t sleep for the festival weekend, but it all just works so well and excitement is already brewing for Head For The Hills Festival 2019! Keep an eye on the website here for further details of the next year’s festival. Did you visit the festival? What did you think? Who would you like to see perform? My warm up post on the Head For The Hills Festival caused some controversy as some didn’t think this was the best line up ever and after speaking to people about this, now have a very long list of bands requested as headliners for next year. The consensus opinion for Head For The Hills 2019 headliners was the ‘Lightning Seeds’ – which I have to agree is an amazing choice and I would love to see them perform in Ramsbottom. Ian… if you read this… you’ve been requested!